Oh which one are you gonna haf!!!! Hope you got something nice. Have a wonderful Wednesday. So much choice! I would pick one of the biggest ones too...much more fun! I love when dogs make their own choices about toys and treats. You picked a good one. Happy Easter. Hope you scooped up a few of those! We love the big peep! Where did you find it! We want one! Oh my word they are all overs the place. The pink one looks like the best one there is! Oh, if only she wouldn't rip it to shreds --- my sister Maggie's nickname is "The Peep" because she's so sweet and squishy!!! I'd love to get her one, but Mom says "no". Love those Peeps toys! Our PetSmart was out of the big ones, so we'll have to check back next year! Those are some big Peeps! The large yellow bunny looks awful tempting. 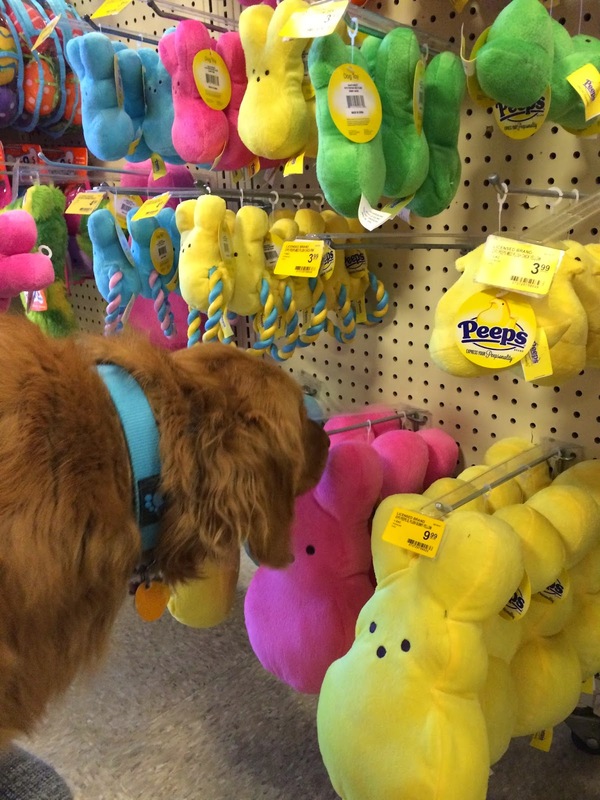 I have never seen stuffed peeps! BOL! Olive would love them. You can't eat that kind! Peeps!!!! Do they have squeakers too?? Jakey says he is available to help remove them! I haven't seen a Peep toy before. I'm guessing someone got one? Those are so cute, I had no idea they made those!